But they had a really interesting question for day 2 — once you take out the snark — about relationship maps which was What game created your most elaborate relationship map? How much of it did you actually use? A quick bit about what a relationship map is: You take the names of the protagonists and draw lines between them with notes. You then write on the same piece of paper with names of NPCs, locations, maybe even events, and start drawing and labeling. And then you’ve got a charted out map of what the relationship between elements in your game’s setting are. If you’ve played Smallville (or other Cortex + Drama games) or the upcoming Unknown Armies game, you’ve created a relationship map during the first game session. 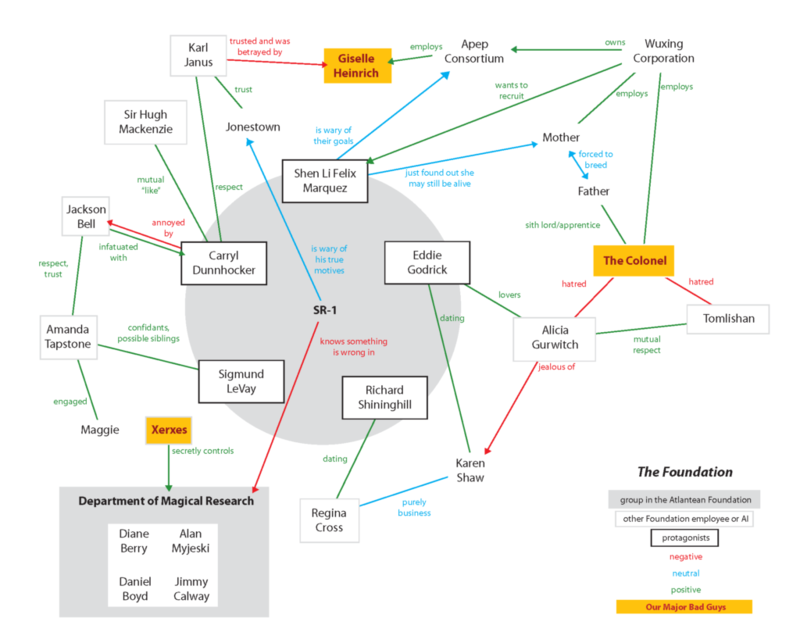 Above is my relationship map for a Shadowrun game set with the PCs as employees of the Atlantean Foundation’s Acquisitions Department. Our PCs are the boxes in the center circle. I used this to keep track of the players involved in the game, but it wound up solving a major question for me: who “Father” was. Whoa! Big reveal! One of those three’s characters — all who had lost their fathers3 — has their father alive, and working with the bad guys! So who was it? I didn’t know. I just threw that in there ‘cause it was One Cool Moment. I looked at the relationship map. Bo’s guy had a lot of relationships with people. Ben’s character had links to people and organizations. But Brian’s character4 only had ties to organizations, no people outside the group and the group’s boss. Obviously this Father person was Brian’s character’s father. They’re both the same game. Although now, the favorite SF RPG has changed a bit. I’m tempted to say it’s The Sprawl, but I haven’t played that. But it is a combination of Shadowrun (especially when they finish that The Touched supplement) and it’s Powered by the Apocalypse. I’m not willing to say that it’s my favorite game system as I’m having a hard time thinking of PbtA games as anything but tweaks of the original Apocalypse World games, so I’m still going with AW for favorite game system.